Delve is a file hub, collaboration space and enterprise social network built using the Microsoft Graph and included in Office 365. When trying to boil down a complex piece of software into its core functions, sometimes words fail to convey enough information. So if that previous description didn’t mean anything to, here’s an analogy instead: Delve is like a cupboard which intelligently and automatically fills itself with things from other cupboards. You might have the people cupboard where you store your co-workers (not literally, just their details), your file cupboard where you store your documents and a sharing cupboard where your co-workers put files they want you to have access to. Whenever you open the main cupboard, Delve fills it with documents it thinks will be useful to you based on a range of criteria. If what you want isn’t in there, you can filter the contents of the cupboard to find it, otherwise, you can take out your file and get to work. Alternatively, you can look for people in the main cupboard and Delve will fill it with your co-worker’s details, a personal bio and other important information about what they’re doing and how to contact them. Whilst the cupboard analogy may not be perfect, it hopefully gives you an idea of what Delve is for. If the cupboard analogy has failed you, then perhaps describing Delve as the online, cloud enabled File Explorer v2 will fare better. It’s important to note that a common concern with Delve is that it since all your files are accessible through Delve, all your files are surely stored on a Delve server. This is not the case. Going back to the cupboard analogy, when you open the main Delve cupboard all your files appear inside but are still in their respective cupboards. The Delve cupboard is simply a collation of the sources of your files and a collection of links to the sources. This means security or regulatory concerns over files being stored on an external Delve server can be dismissed. 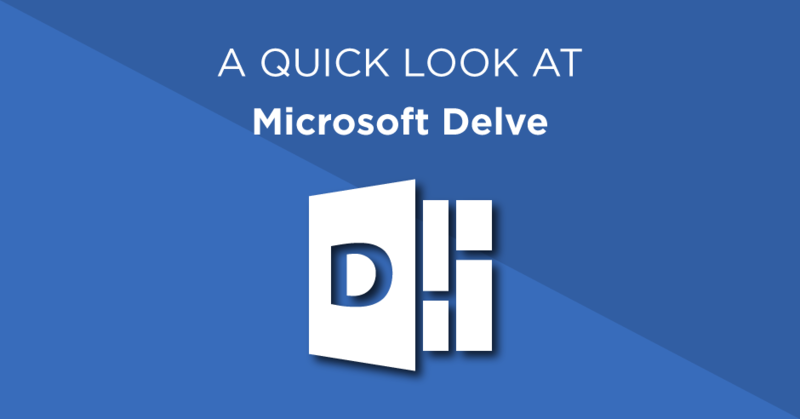 What are the benefits of Delve for businesses? Unlike social networks such as Facebook where the default is to expose all your pictures and posts to your social group, Delve keeps things private unless you specify you want content to be shared. Granular control is given to users, allowing them to dictate who gets to see their files, keeping company information safe. By default, a file on Delve has the same access permissions to where it’s stored. For instance, if you have a file stored on a private folder, only you will be able to see and access it through Delve. Alternatively, if you have a file stored in a shared OneDrive folder then only you and the people the folder is shared with will be able to see and access it. Files and other sensitive information is kept private by default. Delve is accessed through a web browser such as Chrome, Safari or Edge which means as long as you have an Internet connection, you can access the program. This is particularly valuable for remote workers as they gain just as much value from the software as an in-office employee does. Firstly, it allows for a document to be in two places at once without having to create a copy of the file – improving navigation speeds, enabling more logical file storage and making it easier to access important files. Secondly, it prevents long folder chains which are often slow to navigate and can be awkward to use when trying to find a single specific file. The enterprise social media platform aspect of Delve comes through most prominently in its user profile section. 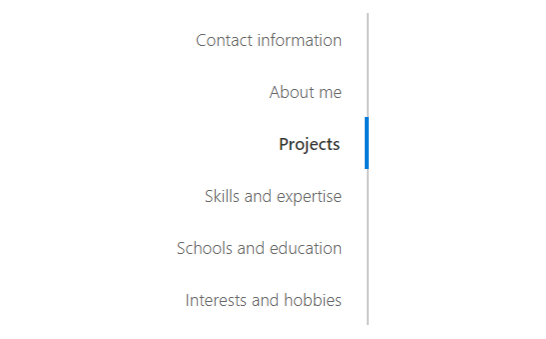 Profiles allow Delve users to include their contact details, a short bio, a list of projects being worked on, skills and expertise, schools and education and interests and hobbies which combine to give a good idea of the person whose profile you’re looking at. Whilst the value of this feature for a large business is clear, in a small business where everyone knows each other it may not seem so useful. However, there are many cases where it comes in handy. The projects and skills and expertise sections in particular can be used to find out what everyone is currently working on as well as who would be the best person to ask for advice if you need help with your own projects. Users can enter a variety of information about themselves on their profile. Microsoft Graph is a collation of activities and content collected from user actions across the Office suite. It allows for more personalised content to be displayed and syncs data across multiple Microsoft programs. This means that using Delve alongside other Microsoft products provides further advantages and integrations. For example, Yammer conversations can appear in the list of content cards and can be pinned to your own boards and your recently accessed files appear more prominently on your documents page of Delve. By integrating the data and user actions from across multiple programs Delve is able to provide a more personalised user-centric experience. Rather than just looking at a document’s title, the search feature in Delve additionally scans the contents of a document for your search terms as well. This is particularly useful for when searching for a document someone else has made and shared with you, but you don’t know the title of. Delve’s search function also lets you search by people, allowing you to look at their profile and see any documents they have shared with you alongside their details. If you’re interested in getting Delve, it’s included freely within certain Office 365 licenses. If your business is yet to adopt Office 365, see our blog post on the topic to discover some of the great features you’re missing out on.